Batobus is a river transport shuttle service on the river Seine which gives you the freedom to explore central Paris. An original and enjoyable way to explore the capital with your partner, friends or family! With the Batobus Pass, you can get on and off where you want, when you want, as often as you want, as long as it is valid: 1 day, 2 days (consecutive) or 1 year! The six trimarans in the fleet are both eye-catching and modern. Each Batobus is named after a famous Paris landmark (Vendôme, Trocadéro, etc.) and offers comfort and maximum visibility.
. An outdoor area at the back of the boat provides a magnificent view of the banks of the Seine and the many Paris monuments. 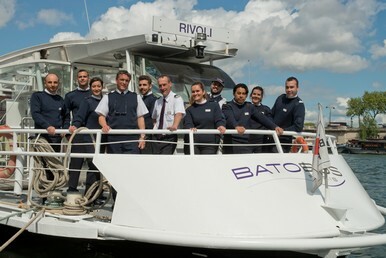 Our team includes ticket agents, skippers and our on-board staff are on hand throughout your journey. They ensure your safety and will indicate the main points of interest near the stops (it is not a guided tour however).